Serving communities and neighborhood’s throughout Washington DC metro area, including Cleveland Park, Spring Valley, Pallisades, Georgetown, Kalorama Heights, Friendship Heights, Foxhall, and Adams Morgan. Also serving Northern Virginia counties and neighborhoods. Cleaning your gutters is a tedious, dirty and even hazardous chore. But it’s critical. Clogged gutters can lead to roof, siding, landscape and even foundation damage. In the Mid-Atlantic states, clogged gutters can also lead to build up of heavy snow and ice that can cause gutters to break off completely during the winter months. The Gutter Helmet® gutter guard system keeps pesky debris – leaves, acorns, twigs – out of your gutters so rain water flows freely into your downspouts and away from your home. Never clean your gutters again! 100% Guaranteed! 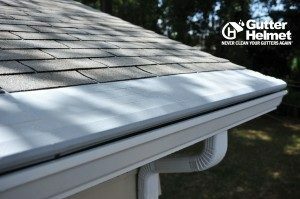 The Gutter Helmet® gutter guard system is the best gutter protection product on the market. With over 65 million feet installed nationwide and a lifetime manufacturer’s warranty – the strongest in the industry – Gutter Helmet® is the clear cut choice for Washington DC and Northern Virginia rain gutters. Gutter Helmet® Gutter Guard Installation for 34 years! Gutter Helmet® Systems and Harry Helmet® is the official installer of the Gutter Helmet® gutter guard system in and around Washington DC metro area. We have installed thousands of Gutter Helmet® gutter guard systems throughout the Mid-Atlantic states. See what some of our happy customers have to say. Read some gutter guard reviews. And learn how the Gutter Helmet® gutter guard system works. Contact us at 1-888-5-HELMET or fill out our online form for a free estimate.